There will be a point of time when you should write something important! 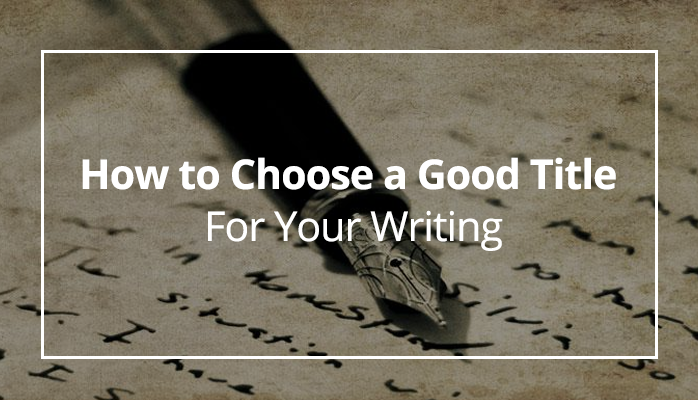 It can be a personalized essay, projects, assignment, or homework. Every piece of writing requires a catchy title that can increase its net worth and overall outlook. You will be astonished to note that nearly two million blogs are posted every day. And, the hunt for unique titles is easy said than done. So, are these two million blogs written with dissimilar headings? How do some blogs attract more readers than the rest? If you are breaking your head with these questions, the next few tips will lend you a hand of help. No one wishes to read boring literature with redundant points and titles. Everyone demands for variety and color. If you want people to run behind your blog; you should give it an engaging title. Make the title sound emphatic, actionable and intriguing. These are traits every online reader longs for. For example, an actionable title would state that the article is about to make you do something amazing. Where as an intriguing one will take you through strange emotions. The more intriguing you get; the more famous your piece of writing will be. The virtual market is all about meeting and exceeding expectations. For a successful writing title, the expectations must be set high and right. This covers one third of the challenge! If someone sees your name next to a piece of writing, they should feel motivated and inquisitive. The title must encourage them to read the document earnestly. Gone are the days when people went behind long writing titles. Today, the hunt is for short and sweet titles that are to the point. It is always a wonderful idea to stress on what you are going to write about. This way unexpected confusions wouldn’t rise. However, if you want the reader to guess the piece of writing, make the heading a small puzzle. After all, the internet is loaded with individuals who love puzzles! To ensure search engine optimization, you must include keywords in the title. However, that doesn’t mean you must go crazy with keywords and phrases. Keep the count low and make it as meaningful as possible. Regardless of the keywords in the title, potential readers will know what you are trying to express. EssayCorp has several years of experience in helping potential students with tacky writing assignments. The next time you feel lost or confused on what your write-up’s title should be, fear not! We will make sure your piece of writing has a catchy title that would keep all readers lured to your piece of work. For any academic assignment writing help, simply contact to us”.